Heavy-duty rubber wall guard absorbs and deflects impact from wheeled traffic to protect the wall and reduce maintenance costs. Heavy-duty rubber wall guard absorbs and deflects impact from wheeled traffic to protect the wall and reduce maintenance costs. 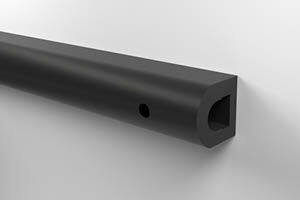 Our dock guard is made of thick 3/4″ (11mm) EPDM, capable of withstanding repeated impact.